My love for tahini began several years ago and one of the very first recipes I posted on this blog (over four years ago), was for a Creamy Orange Tahini Dressing. Since then, and I think it’s safe to say, I’ve become addicted to tahini. Not only is it creamy and delicious, but it’s also packed with protein, calcium and iron…so win, win! I love tahini so much that we go through at least one 16oz jar a week. So, get ready for plenty more tahini recipes in the near future! With warmer weather approaching, I’m getting excited for farmers markets to start back up again and stocking our fridge with fresh, local produce. Lots of raw meals, such as kale salad, replace the hot soups we’ve been enjoying these last few months. Add all of the ingredients for the dressing into a high-speed blender and process until smooth. Salt to taste and if you’re looking for a thinner consistency, add more water as needed. It will thicken a bit in the fridge, or even as it sits, so keep that in mind. Combine all of your raw veggies in a large mixing bowl and then slowly add the dressing – massage it all together either by using your hands or a spatula. Depending on how large your salad is, or how heavily coated you like your veggies, you may or may not have dressing leftover. Enjoy right away, or store the mixed salad in the fridge to chill until you’re ready to eat! Leftover dressing will keep in the fridge for 3-4 days. Additional toppings are always a great idea – such as sliced raw almonds, pumpkin seeds, sunflower seeds, hemp seeds or even extra dressing! 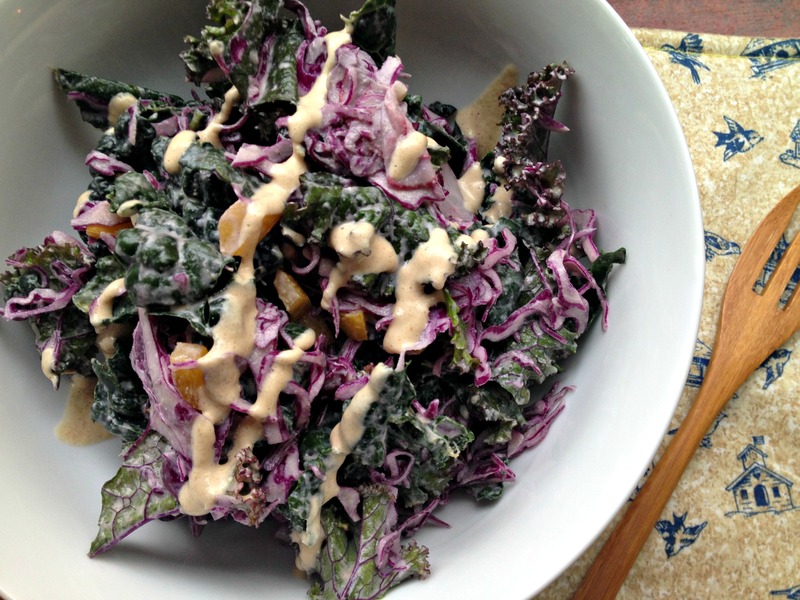 *** If you’re not a fan of spicy dressings, my Cheezy Garlic Tahini Sauce works great on salads and even kale chips. This chipotle tahini looks soooo good Mandy!! As you know, I’m a fellow tahini addict so I can never get enough and I love the added chipotle. I use that spice in so much of my cooking….I love the smoky heat it adds. Great recipe! 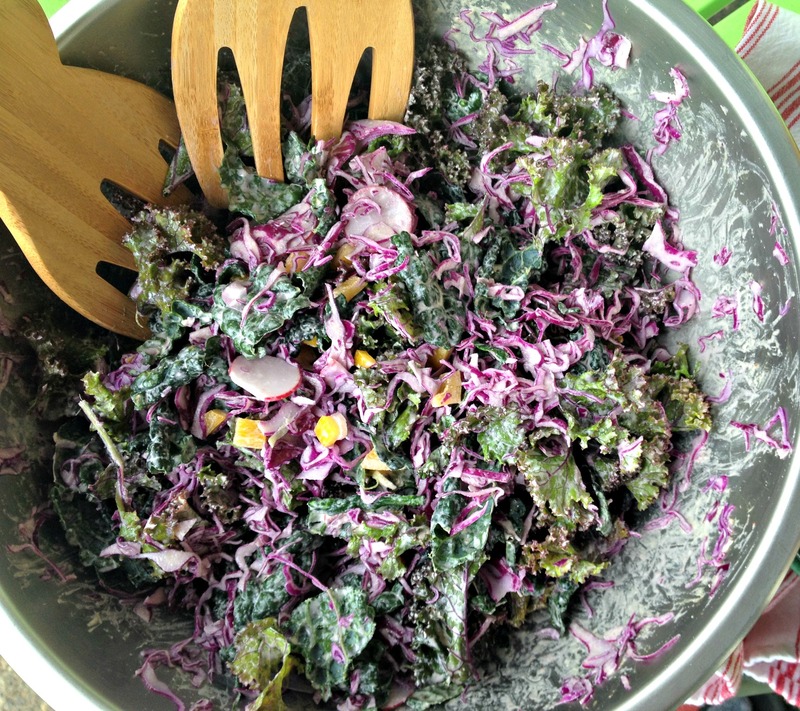 I bet it’s just fabulous over this kale salad! Just found your website through Brandi @ The Vegan 8. I have to say, I’m becoming addicted to tahini as well and can’t wait to try some of your sauces/dressings. They look fabulous! This looks awesome Mandy!! Tahini addiction continues!! !